“I know that things seem difficult, but let’s keep this in perspective“, i.e. let’s look at this rationally; let’s not be overwhelmed by its importance. Just as we use the word “perspective” when talking about issues that are meaningful to us, so we can use techniques of perspective to add emotional meaning to pictures. As artists, we have the choice to emphasise or distort the vastness of a landscape, the nearness of a figure, the slope of a hill and so on. Don’t be put off by the technical aspects of perspective…Read on and be inspired. One of the greatest subjects in art is “Our place in the world”. As individuals or as a group, where do we “belong”? How do we relate to the landscape around us? What do I mean be “where do we belong?” Taken most simply and literally, this could just refer to where we are on the planet in the physical sense. This in itself is a fascinating subject and can generate plenty of discussion… For example, why do people congregate in great numbers in some places and not in others? Thinking more laterally about the question, “our place in the world?”, could lead to further discussion. What is “home” to each one of us and to our communities? What is our importance in the world? Much of our natural environment is currently at risk of destruction – how do we relate to this, as carers or as passive onlookers? We could also consider the effects of time. This place where we now stand – will it still exist long into the future? What was here many years ago? A basic diagram can show where a figure stands on the planet. An interesting piece of artwork can go much further than this, perhaps leading us to think about other aspects of that person’s “place in the world”. For example, take a look at John Minton’s pen and ink drawing, above. It is prosaically titled “Young man asleep in a barn”, but it has a thought-provoking, even spiritual feel. The man appears safe and comfortable in an intimate space. The barn doors are angled in such a way that we, the viewers, are visually led into the building. Looking at this picture, I feel as if I am being invited to imagine myself in the place of the resting figure. Outside the barn, fields and sky stretch out into the distance. This drawing gives a clear sense of a “here” and a “there”. The figure should perhaps feel vulnerable sleeping “rough” with the doors wide open to that unending landscape, and yet this image has an atmosphere of peace and protection. 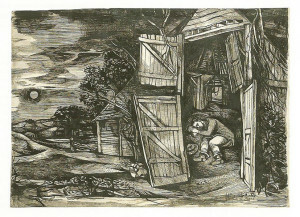 Was Minton suggesting the presence of a kind, protective god in drawing that atmospheric landscape around the barn (notice how the shape and tone of the moon echo those of the man’s face, as if they are somehow in sympathy with one another here)? From the technical point of view, notice how Minton has used linear perspective to give his image spatial depth. There is a path that narrows into the distance, and the barn is drawn at an angle so that its edges lead us into the picture. The simple device of drawing objects smaller in the distance is also used here to good effect, e.g. in the rendering of trees. Think how tiny a person is compared with a vast landscape, whether a mountain range or a great plain. A great expanse of visible land compared with us, the little figures, can be awe-inspiring. You do not need to explore distant lands to experience this. Just look up – the great dome of the sky physically dwarfs each one of us. The English artist, Samuel Palmer, imbued his landscapes with a sense of wonder and is often described as a “visionary” artist. He did travel to Italy and paint both towering trees and awe-inspiring views from mountain sides. To Palmer, the leafy countryside back home in Shoreham was also full of wonder and he shared this experience with us in his landscape paintings. He is perhaps best-known for his intense monochrome images of sheep, rolling countryside, villagers and churches in the dusk. 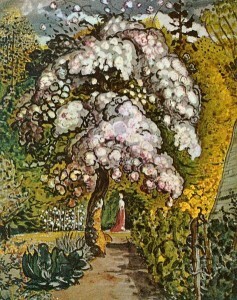 In his painting of a Shoreham garden, above, Palmer shares with us the joy of seeing a tree in full blossom. Whether a miracle of God or of nature, this is a precious sight to behold. Palmer has added an elegant figure to this painting, tiny because she is distant. Despite the beauty of the figure, our eyes are always drawn back to the incredible tree in front of her. 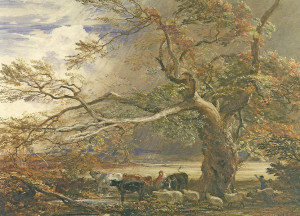 We are used to seeing paintings of elegant women with a pretty garden backdrop but, in emphasising the size and exuberance of this tree, what is Palmer suggesting about the importance of the natural world? Above and below are two images from a series by Bob Dylan in which he shares something of his experience of looking at the world about him. He developed these from his own sketchbook drawings. What is it like to be a great singer-songwriter, celebrated wherever you perform? In these images, Bob Dylan mostly shares rather mundane experiences of travel and of waiting, to which we can all relate. From the use of perspective in these pictures, we can tell where Dylan was sitting as he drew in his sketchbook and now, we, the viewers, are invited to imagine ourselves in such a place. Notice how he uses any lines that he can see (pavement tiles, paths, wooden slats on a table, etc.) to emphasise the effect of linear perspective. 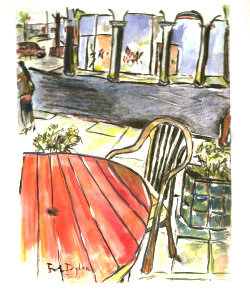 For the café image, above, Dylan must have been sitting at the round table facing the road, perhaps leaning back in his seat. It is a thought-provoking image. I can empathise with the experience of sitting contentedly at a table, gazing curiously at the world around me. But, with the empty chair and table, could this also be understood as a sad picture, a lonely stop at a café? Bob Dylan’s use of linear perspective always makes perfect sense to me (I can understand where he was sitting or standing as he drew) but is not always mathematically correct or consistent. This is fine by me. In real life, we do not see the world from a completely fixed viewpoint like a camera on a tripod. We naturally move our eyes and head almost continuously, and see different parts of the image from slightly different viewpoints. For example, if sitting at a café table, it is difficult to focus our eyes simultaneously on the table top and on the shop across the street. We are aware of the existence of both the table and the shop, but would tend to move our gaze down to look at the table because it is so close by. Another reason for allowing perspective to be distorted is to help give the impression of moving past the object. Below, for example, is an imposing house as seen from the road. 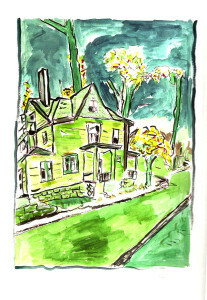 Even if the artist has stopped for a while to draw this house, the resulting picture suggests a view from a moving car, perhaps a meaningful landmark on a well-travelled route. If you are not yet familiar with basic perspective techniques, then I recommend spending time learning these from a book, teacher or website before you go any further. A quick search online has brought up quite a few websites in which the techniques of perspective are explained, in some places more clearly than others. If you are not afraid of long words, try clicking here for a more in-depth explanation. And if you can recommend a book or website that you have found to be a great resource in learning perspective techniques, then please do contact me so that I can add the link to this page. When drawing in your sketchbook, don’t just record objects surrounded by blank space (a face, your dog, a bowl of fruit, etc. ), but add in a few background lines. If drawing a pet or a pair of shoes on the floor, do mark in the edge of that floor, and perhaps add in a few lines of floor tiles if they are present. If sketching people, a very few lines to suggest a table edge, door edge, floor edge, etc., can make sense of where those people are in relation to you. If confused about which way to angle the background lines, always remember that horizontal lines that are at your own eye level will be horizontal on your page, and that lines below this will angle up towards a vanishing point, while lines above the eye level should tilt down. You can also check angles now and again by holding up a straight edge . A fully-grown tree next to a house. You might position yourself at an angle to the building, so that its straight edges slope away from you in the drawing. Which is more massive, the tree or the building? A railway platform with one or more people on it. How big is a person compared with the available space? Look along the platform for a clear view of receding tracks and edges. A statue in a public space. How massive is the sculpture, life-size or bigger? Is it above or below your eye level? Mark in a few basic lines before you spend time drawing the statue itself, and do include something of its plinth. If people walk in and out of view, you might want to sketch a figure in lightly, at least to show how tall a person is compared with the statue itself. A tiny child on a chair. Gravestones within their setting. Are they positioned in regular rows, or is each memorial an individual? Museum exhibits (anything from taxidermy to ancient relics) next to one another in their current setting. What is the reaction of other visitors to these objects? Is it possible to fit a figure or part of a figure into your drawing, perhaps gazing at your object of interest?